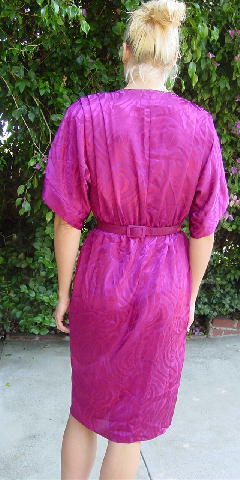 This vintage 100% polyester dress (hand wash or dry clean, use cool iron) has short wide (mini kimono) sleeves and shoulder pads. It's in a burgundy-wine with a shiny tone-on-tone design pattern and it's a L.T.D. by Roberta. There is a crossover 9" deep V neckline and an elastic waistband with a fabric covered (front side) V shaped pull-through buckle belt. 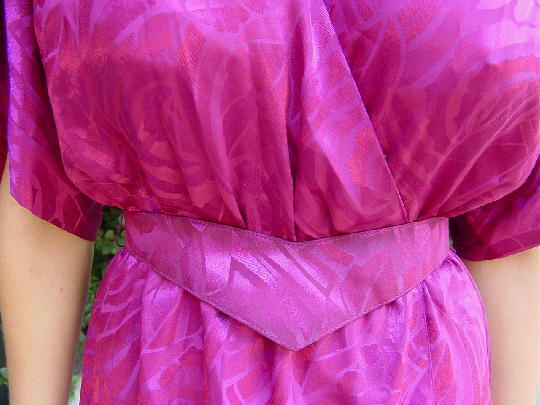 The bodice has 3 pleats extending downward from the shoulder areas on each front side. The right side of the skirt has an angled crossover panel. It crosses over 10 1/2" in the center. The front center crossover is 2 7/8" shorter than the back. It fits more like a size 4/6. shoulder pad to shoulder pad 18"
shoulder to end of sleeve 10 1/4"